Nuclear fission of uranium-235 can be triggered by the nucleus absorbing a neutron. The uranium splits up into two lighter nuclei (barium & krypton) and 2 neutrons are released. These two neutrons can collide with other uranium nuclei to cause more fission. This process is called a chain reaction. If there is only a small amount of uranium most of the neutrons will leave the material without colliding with other uranium nuclei. So for a chain reaction the uranium must be above the critical mass (this miniumum mass required for a chain reaction to take place). The fuel rods in a reactor contain the uranium used in nuclear fission. 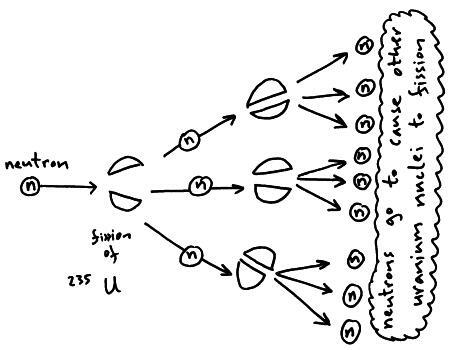 The neutrons produced during fission are fast moving and so to increase the probability of a neutron entering a nucleus they must be slowed down by the moderator. Slow moving neutrons are called thermal neutrons. 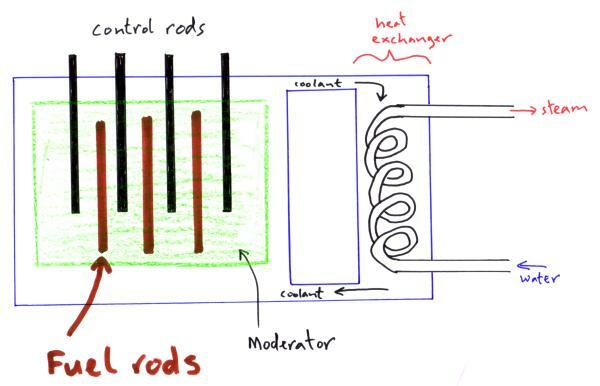 The water which is heated by the coolant in the heat exchanger becomes steam which turns a turbine which is connected to a generator which them produces the electricity for the consumer.